Getting you oriented and set up for all that there is to do here in Jackson Hole, Wyoming. Welcome to Jackson Hole! Whether its your first time in town, you're trying to remember where things are after a few years, or just trying to locate something new, let us help you get started. To make navigation easier—and give you tons of tips from burgers to bear spray and boots to brook trout—check out our Jackson Hole Traveler print edition and carry one with you! Most stores or coffee shops carry free copies for you to pick up. Welcome to the Old West. Whether you’re seeking wide skies and grand views, world-class outdoor recreation, or an old-style adventure complete with cowboys and saloons, Jackson Hole is the place for you. But what exactly is Jackson Hole? This is actually the No. 1 question asked by visitors. 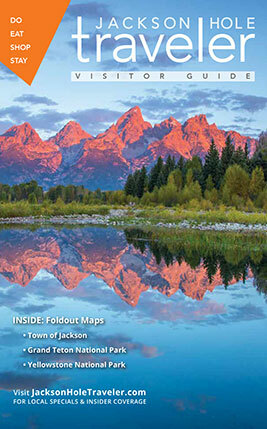 “Jackson Hole” refers to 13-mile wide, 48-mile long valley that runs parallel to the eastern slope of the Teton Range. It was originally named after 1820s fur trapper Davey Jackson—trappers called a valley, a "hole." The Hole begins at the mouth of the Snake River Canyon and stretches all the way to the shores of Jackson Lake at the southern edge of Yellowstone National Park. “Jackson,” on the other hand, is our main town (within "the hole") of nearly 10,000 that serves as the seat of Teton County and heart of the area’s mountain culture. So, Where Exactly Are We? Jackson Hole is the broad valley that lies at 6,200 feet and runs from north to south along the Snake River, between the Teton Mountains to the west, and the Gros Ventre Mountains to the east. The town of Jackson is situated toward the southeast of the valley, tucked in under Snow King Mountain. To our north is Grand Teton National Park, the Jackson Hole Airport, Jackson Lake and eventually Yellowstone National Park, as well as Togwotee Pass. To the west of town you'll cross the Snake River before arriving at the hamlet of Wilson and the southern peaks of the Tetons. A bit further north on that same western side of the Snake River is Teton Village, the home of our world famous skiing at Jackson Hole Mountain Resort, and a bit past that are the mighty "cathedral group" of the tallest Teton peaks. To the south our valley ends and narrows into the Snake River Canyon, beginning about 25 minutes from town, where most of the area's whitewater rafting or kayaking activity is concentrated. To the east of town are the Gros Ventres Mountains and huge expanses of wilderness where you might travel about 80 miles before coming to a paved road. Before all that though, there is the National Elk Refuge, great camping up on Curtis Canyon and hiking or biking trails up Cache Creek. In case you do, navigation-wise, here's a map of the Jackson Hole valley (mind the sideways orientation). And a map of the town of Jackson. Guests on the way into town from the airport or national parks will recognize the Jackson Hole and Greater Yellowstone Visitor Center by its sod roof and Rocky Mountain-inspired modern architecture. The Visitor Center is located at 532 N. Cache and not only offers maps and activity information, but also helps guests acquaint themselves with the local ecosystem through a series of dioramas, educational displays and a spectacular wildlife viewing deck overlooking the National Elk Refuge. If that isn't enough, the visitor center sells national park passes as well as hunting and fishing licenses, making this your one-stop destination for adventure planning in Jackson Hole. If you’re already out and about in Jackson Hole, or just want a high-tech learning experience, check out the Craig Thomas Discovery and Visitor Center. It sits at one of the most popular entryways to Grand Teton National Park, just 12 miles north of Jackson in the town of Moose. Models, photo murals, interactive exhibits and steaming video feeds put a 21st century spin on the Tetons’ timeless grandeur. For a list of upcoming events at the Craig Thomas Discovery and Visitor Center, or general information about Grand Teton National Park, call the center at 307-739-3399 or visit the website. With geysers, grizzlies, and famously wild terrain, Yellowstone National Park can overwhelm a visitor with possibilities for adventure. Fortunately, the National Park Service operates a myriad of visitor centers scattered throughout the park. If you're heading into the park from Jackson, check out the visitor centers at Grant Village and West Thumb which are located just off of the park's main north-south thoroughfare, Hwy 89. The park also operates permanent visitor centers Fishing Bridge, Madison Junction, Norris Geyser Basin, and of course, Old Faithful. Call the Park Service for more information at 307-344-7381. Temperatures can vary widely any time of the year, especially when you change elevation. We have more than 7,000 feet of elevation difference to consider between the valley floor and the top of the Grand Teton, which means that hikers, climbers and skiers need to dress the part, as weather conditions can change quickly with changes in elevation. Make sure to follow the only trusted source for Jackson Hole weather, Mountain Weather, produced by our local weatherman, Jim Woodmencey. These days, you don't have to go robbing stagecoaches if you need cash in Jackson Hole. There are plenty of 24-hour ATMs in the area operated by both local and national banks. The Bank of Jackson Hole has numerous ATMs situated in hot spots like Town Square, Teton Village and at the airport. Wells Fargo also operates ATMs at the airport and on Town Square, as well as in the famous Million Dollar Cowboy Bar. Whether you're in need of medicine, whiskey, or fresh produce, you won't find yourself wanting for provisions during your stay in Jackson Hole. So, now that you're here, enjoy! A stay in Jackson Hole offers something for everyone. From the crystalline snows of winter to the waving wildflowers of summer, it's easy to see why residents and visitors alike value and respect this precious area. Jackson’s mixture of world-class restaurants and rodeos, of hoedowns and art galleries, or of relaxation and adventure will have any visitor scheming up ways to delay their flight home.